Learn to work with balanced bio-energy fields. We filter the water, air & our food we consume - And what of the Energies that permeate the space all around us? no more 'bad vibes'! Most of us don't consider filtering the energy existing around us at all times. Remember, every 'thing' is energy. Life force energy exists throughout our universe, it is the spark that animates matter and creates passion. All sustainable life relies on this bio-energy. Although we may not be able to directly see, taste or touch the energy around us, we can feel it if we are sensitive to it. Daily experiences in today's cultures & paradigm, both positive and negative, leave us needing balance & peace to restore and revitalize our being. One thing that differentiates all forms of bio-energy (shakti, chi, orgone, prana, ectoplasma, etc) is how it is expressed & processed. Energies are associated with different forms (physicality, feelings, ideas, etc.) and to remain out of division or avoid placing anything above one's Self, we must realize that all energy has the same source. Energy is simply expressed in a unique way through the creative spirit; all is energy, energy moves through you, you are energy, energy is you. Energy is input to our beings, and output through our actions - it is up to us how we direct this energy. We are capable of conscious action that will result in the co-creation of a world of balance, wholeness & harmony! 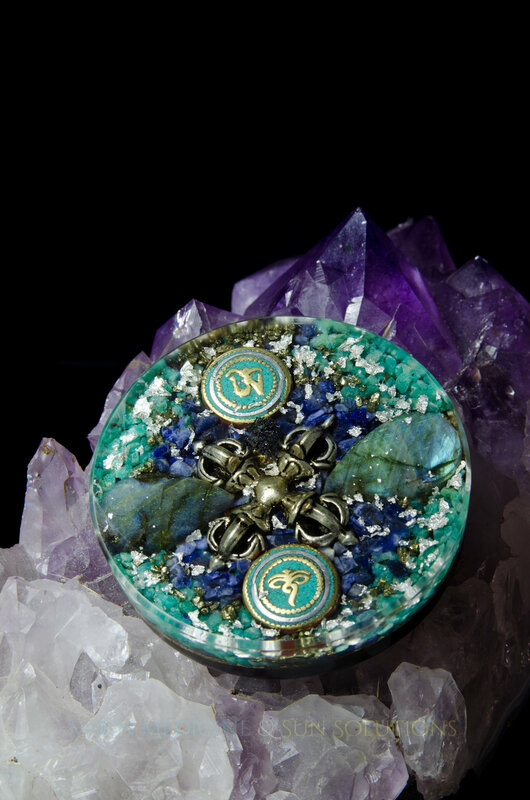 Orgone Generators are tools to help you regain control of your surroundings. If you live in a reality of restricted awareness with polluted, artificial or distorted energy in constant circulation (stemming from wifi routers, cell phones, ill-thinking, violence, etc), you will find your self in dis-ease and dis-comfort. If you choose to expand your awareness and operate from a clean energetic field, you will discover meaning in your life, health, harmony with the Earth and ultimately, a path towards Truth. 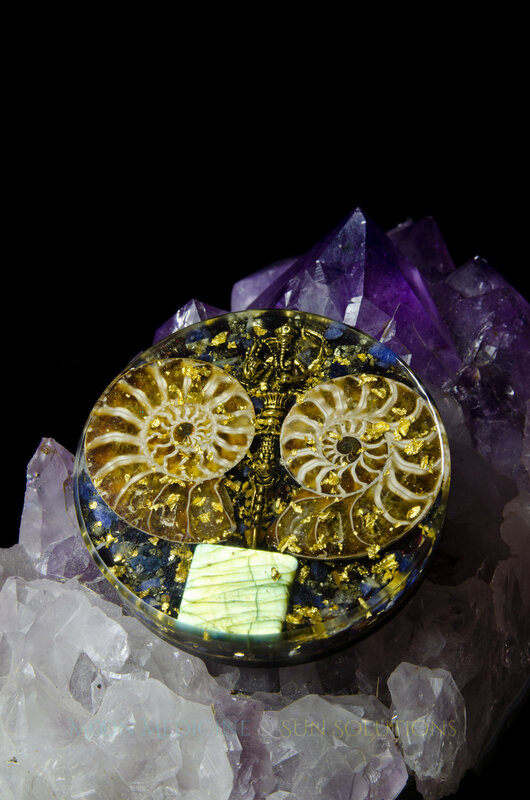 These Generators are a handcrafted matrix of resin, metals, natural materials, precious stones and quartz crystals, intended to neutralize Distorted & Polarized Bio-Energy and attract Positive Bio-Energy into the environment. Devices are molded into Pyramids, Spheres and other Sacred Geometric shapes. Bio-energy naturally permeates through Lei Lines (meridians) of the Earth. Bio-energy exists in a cosmic pool of potential energy, often referred to as the Unified Field, the grand framework of life. Bio-energy is the resonant vibration of Nature's purest, living state. Dr. Wilhelm Reich | During the 1930- 40's, scientist Dr. Wilhelm Reich conducted experiments to detect and measure the existence of this etheric energy, which he coined Orgone. The creative principal has been celebrated throughout history, understood by many cultures who gave it various names, which all express the same omnipresent bio-energetic. Bio-Energy is a cosmic force, that encourages & guides the elements that compose life to harmonize, unify and thus ultimately express beauty in life. For the human this means we remain balanced (neither dominant in creation or destruction) and act with a loving heart. The body, for instance, is a uni-verse in of itself. It is unified, but also in conflict - a paradox in physical form. There are many components that build the body, and each part may not be in alignment with the whole. When the composition of life is harmonized with the cosmic 'way', there is a natural order within. This natural order is a tendency to be creative and loving. All physical matter is a result of the unique expression of energy - observed through our senses as either as sound, color or form. As energy moves out from its source, its characteristics change based on its living experience. Life is molded and formed by its experience, just as all that occurs in our human life dictates our personality. Energy & the unique expression of each human being is altered according to the relationships we encounter on our journey. These relationships include all that we interact with, even our Self. Sacred Space Generators restore balance to energy, or allow an energy's natural & default uniqueness to be expressed. This is similar to effects when meditating, a realigning of one's 'way' of being to its default settings. It is also a generator of an expanding grid of positive bio-energy, allowing users to experience a pure, clear & balanced environment. In this way it is similar to the process of cleansing & clearing a space with palo santo or sage and then programming the space with mantra, song, reiki, etc. Cymatics visualize frequency by placing crystals on a sound plate. Sound, shape and color are intertwined. Frequency is the framework and building blocks of all life. People are becoming more aware of the Distorted Wavelengths of Bio-energy that have manifested through Electro Magnetic Radiation (EMR) emitted from cell phones, phone towers, televisions, computers, routers, microwaves and other electronics. Bio-Energy can also become Distorted & Stagnated through thoughts or actions that promote fear or violence. Imagine playing dissonant, angry music through one of the cymatic sound plates above, it would display a non-symmetrical, corrupted geometry. Distorted Frequencies and EMR are permeating our homes and communities as they distort entire systems of living energy and instead promote depression, anxiety, drought, disease and so on. Charge exists in three states, Positive, Negative and Neutral State. We typically experience our thoughts as either “good” (+) or “bad” (-). During meditation, the goal is to experience neither polarity, to simply just “be”. If you are able to achieve a neutral, balanced mind (Zen), you can tap into an ocean of usable energy to direct your life according to your passions & creativity. Orgone Generators are "meditating" at all times to calibrate the local energetic fields to a neutral state. A balanced energetic field is a sacred space that is conducive for right living. Every person experiences the life-enhancing qualities of this sacred space differently. Your consciousness and awareness will expand naturally when the entire being is working in harmony, and is not distorted or clouded by electronic smog or distorted Life Energy. Each Chrysalis Generator is tediously & attentively handcrafted as a matrix of eco-resin, metals, natural materials, precious stones & crystals, meant to calibrate stagnate & distorted life energy & harmonize the local energy field. Devices are molded into Pyramids, Spheres & other Sacred Geometric shapes that are suited to repattern energy. The secondary function is to establish a positive energy field, or a sacred space conducive for growth and expansion. The matrix materials in combination with programmed intention & frequencies, "flavor" the energy outwards, generating space conducive for creativity, well-being and co-creation. 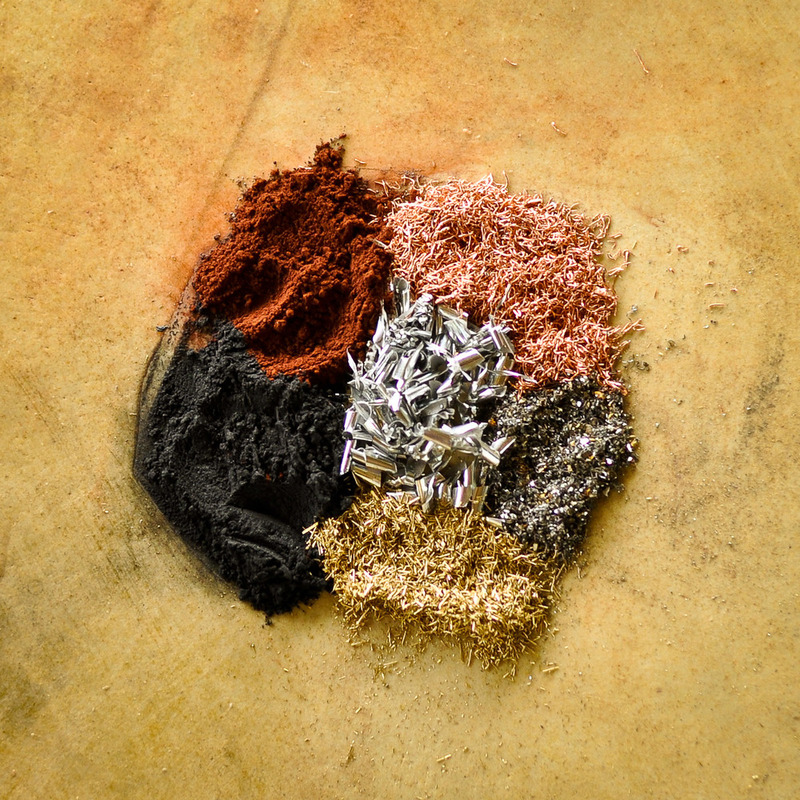 Organic materials of the Generators attract energy, positive (good vibes) and negative (bad vibes) alike. All energy moves in a tendency to be aligned to that of its pure state of being - this is why we have natural desires to be healed and well. Once energy has become distinct in its characteristics, meaning it has experienced the journey of life, it will be attracted to those fields that are aligned to the source from which it came. The metals of the device act as capacitors & conductors, promoting a charge & replusion of energy. This combination of pushing & pulling directs the energy into a chaotic state of friction, great enough that the energy is distilled into its base state and polarities (negative and positive) and recombines at the neutral state in the womb of the matrix, exiting the device as zenned-out, balanced energy. Cystals are essential the matrix of the devices. They are the organizing principle & carry the intention of the device along its journey. In this way, they are the animating spirit of the Generator. Along with the other crystals added to the matrix, the Mineral Kingdom serves to direct the purpose and characteristics of its functionality. Natural resin; the organic material. Our experience suggests that the primary function of a Chrysalis is that of a distiller of energy. For example, in order to produce purified water, we don't have to create new water but rather we can separate contaminates from water through a distillation process. Likewise, since constructive energy and deconstructive energy exists all around us, the Generator works as a tool to cleanse and balance energetic fields. This clean energy is then available in a stabilized, pure form to be utilized by the user. The secondary function of the device is that of a generator of creative (positive) energy. As energy is distilled within the matrix, it is flavored with crystals, intentions & resonances solidified in the device. Balanced, purified energy is zeroed. It can be acted upon, directed with our will and programmed with our intentions. This is why custom created devices are more conducive for specific intentions - the device is programmed to suit one’s needs. Particular arrangements of crystals, tones & music and a meditative creation process create devices that unique to their own functionality and way. No two devices are identical and any device can be programmed intentionally by craftsman to achieve particular results. Devices become activated when interacting with other forms of energy, such as heat, sound, light, electrical energy, magnetic fields, bioenergies (positive and negative) and so on. Each of our devices contain a quartz crystal, keeping the device steadily charged at all times through focused intentions & the piezoelectric effect (voltage created when quartz are put under pressure). 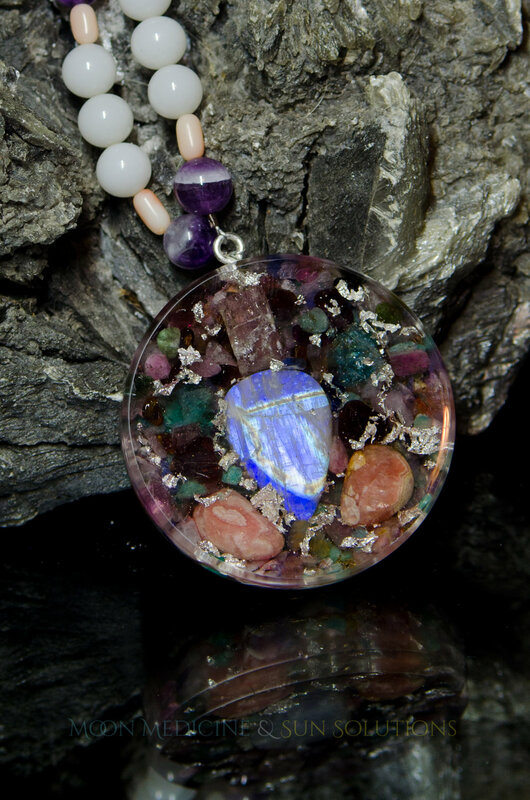 Added crystals, minerals and precious stones inside the device are conscious, working through their own frequencies and can be programmed to modify, direct and enhance the surrounding energy field. Innerstand that the cosmos is always moving forward in expansion. This is the force of unconditional love. The Source of all energy is forever providing opportunity for the expression of life. Thus, in a purified field of energy, Positive Bio-energy is attracted. Energy does not judge, your field will create & attract what is emanated from your thoughts, feelings and actions. With right mind thinking and right action, these fields of Orgone energy can be utilized to manifest positive results for the maturity and growth of one’s being. These devices have been described as one the highest and simplest form of external alchemy. 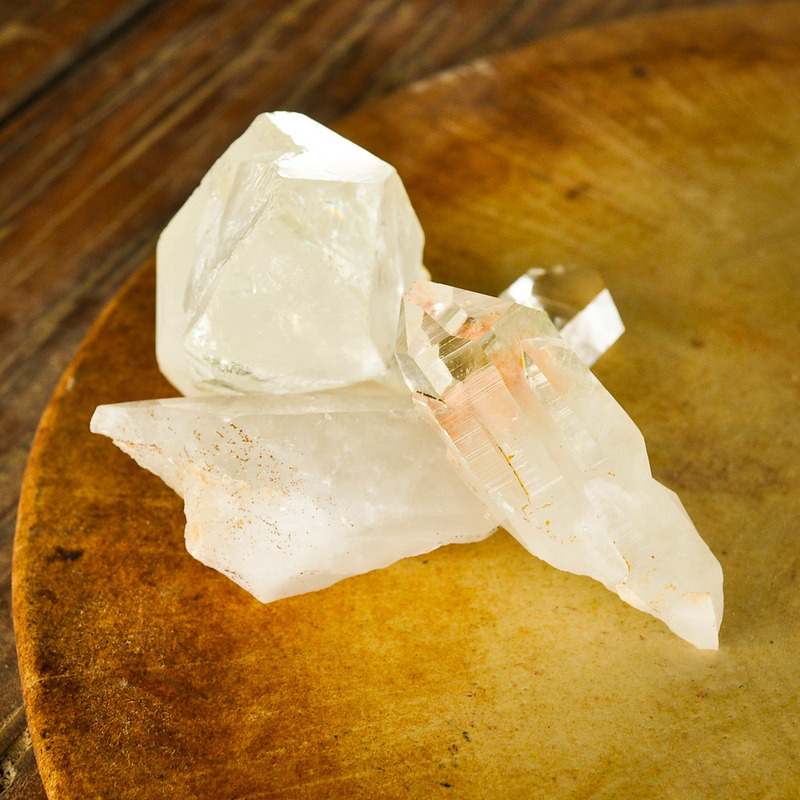 Like crystals, Sacred Space Generators can be placed in polluted areas or space that needs more positive life energy. We can make environmentally conscious choices about what we eat and what we wear, but we cannot avoid the dead energy or frequencies emitted from sources like electrical towers. Specifically, "Tower Busters" can be used at sites of Dead Energy fields (such as cell phone towers, power lines, power plants, etc) to decrease its effects in the surrounding environment. TB's can also be used in lakes, rivers or oceans where toxic waste or pollution is rampant. 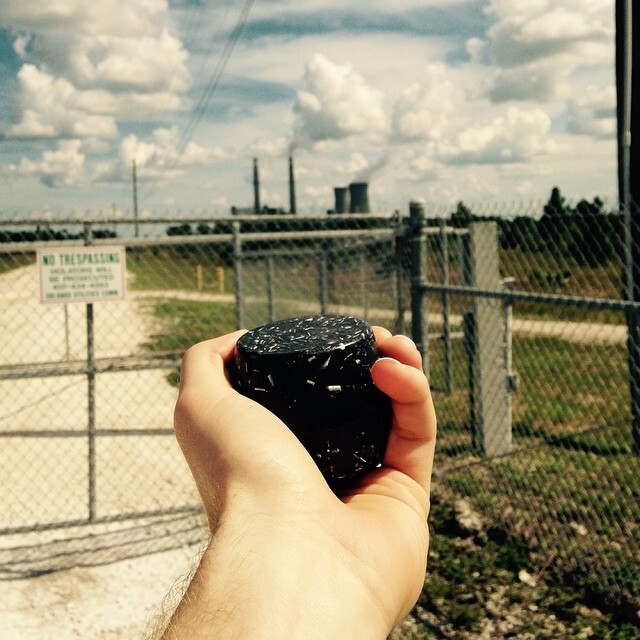 All over the world, activists are "gifting" their communities by simply placing or burying Energy Devices at the base of their neighborhoods electrical towers or lines. We encourage you to share the concepts of bio-energy and its effects on our well being with your family, neighbors, friends and local communities. 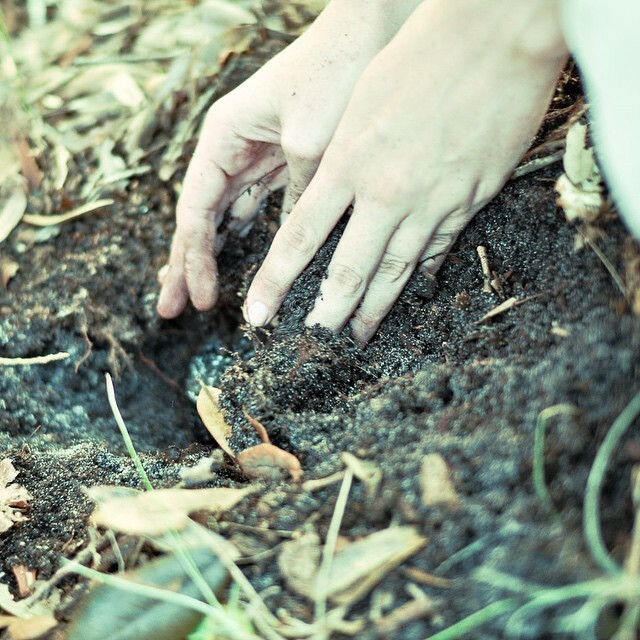 These devices are simple tools to improve the quality of life for all living things. Learn about the impact, benefits & uses of Sacred Space Generators.